Less than a week into its crowd-sourcing fund-raising campaign, Dilmun Hill Student Farm has already reached 70 percent of its $5,000 goal. Donations are tax deductable and will be used to improve the farm’s outdoor teaching facilities and expand the farm’s hands-on educational mission. Help push them over the top. by Mary Woodsen, New York State Integrated Pest Management Program. Accolades like these have earned Elizabeth Lamb the New York State Integrated Pest Management Program’s (NYS IPM) Excellence in IPM award. This award honors people who make outstanding contributions to preventive and least-toxic tactics for dealing with pests. 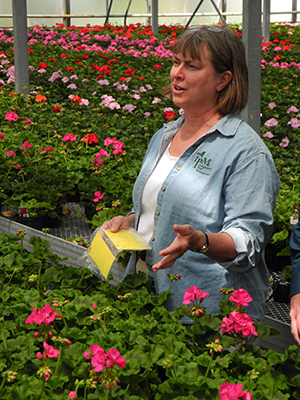 As ornamentals coordinator for NYS IPM since 2006, Lamb has provided scores of workshops for 2,000-plus nursery and greenhouse growers, Christmas tree farmers, and landscapers — people working in industries collectively worth nearly $200 million per year to New York’s economy, and that at wholesale prices. 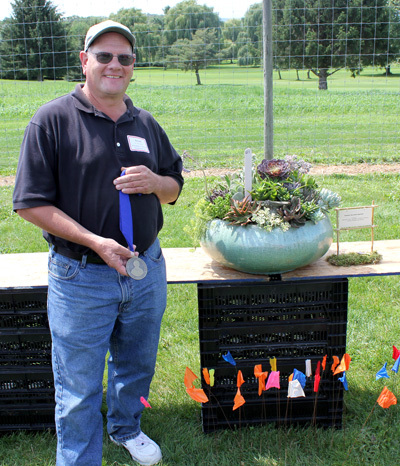 Donald Horowitz, Wittendale’s Florist and Greenhouse, East Hampton, N.Y., won the ‘unlimited’ division in the Kathy Pufahl Container Design Contest. About 100 greenhouse growers and retailers, florists, educators and others attended the annual Cornell Floriculture Field Day August 13. The day started on campus with presentations on the latest showstopping flower and foliage annuals and summer bulbs, invasive species, biological pest control, and alternatives to impatiens, a popular shade-loving annual that has been plagued in recent years by a new disease, impatiens downy mildew. In the afternoon, the action shifted to the Bluegrass Lane Turf and Landscape Research Center adjacent to the Robert Trent Jones Golf Course northeast of the Cornell University Campus. 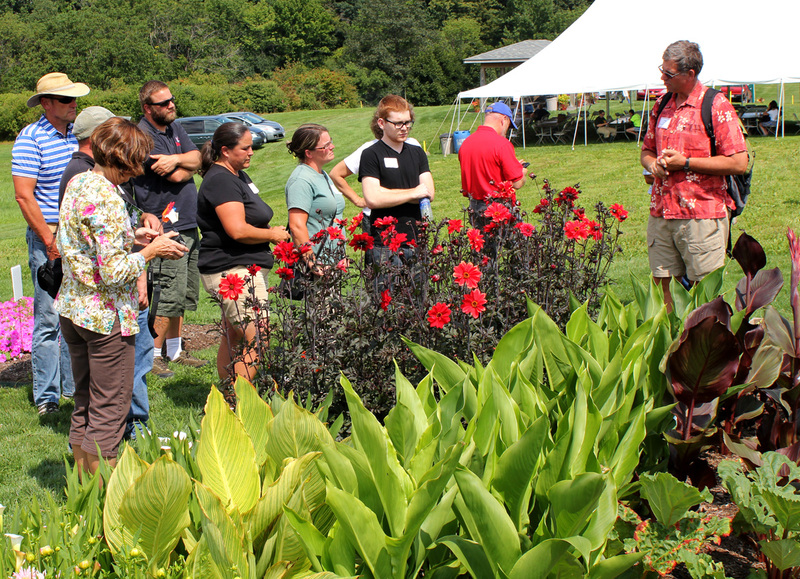 There, participants toured annual flower and foliage plant trials and had hands-on sessions to learn more about pests and diseases that attack landscape plants. 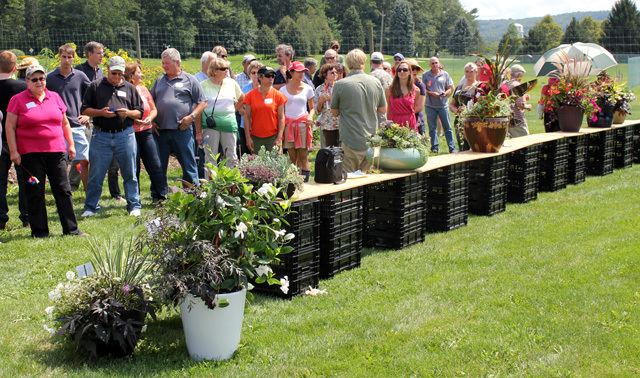 One of the highlights of the afternoon was the annual Kathy Pufahl Memorial Container Design Competition, which through entry fees has raised more than $10,000 for IBD research at Mt. Sinai Hospital over the last 10 years. View container contest winners and entries. Bill Miller (right) talks about uses of summer bulbs — such as dahlias and cannas. Brian Eshenaur, Ornamentals IPM Extension Area Educator with the NYSIPM Program, makes a point about insect and disease problems in the landscape. 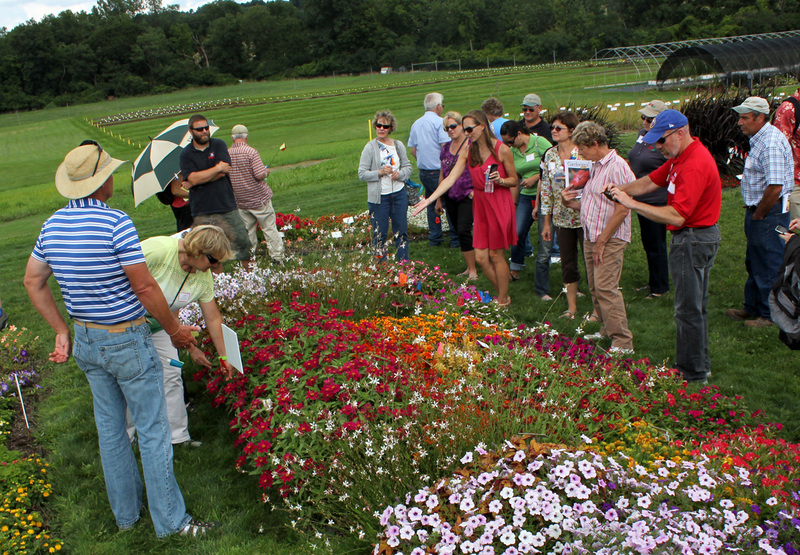 Nora Catlin, floriculture specialist at Cornell Cooperative Extension of Suffolk County, tells participants about her experiences with varieties in the annual flower trials at Bluegrass Lane. Neil Mattson announces winners of the container contest. Dilmun Hill, Cornell’s student-run farm, is holding an online fundraiser to improve their outdoor teaching facilities and expand the farm’s hands-on educational mission. Donations are tax deductable, and will be used to buy portable tables, folding chairs, an easel, a whiteboard, recycling and hand washing stations, a small shelter/shade tent and a portable drinking water station. A kiosk to provide information to visitors (e.g., maps and volunteer opportunities) will also be installed at the entrance of the farm and include a small green roof. Read more about the campaign and how to donate. Whether you are a seasoned, new, or aspiring farmer, there’s something for you in the 2013-2014 line-up of online courses presented by the Cornell Small Farms Program and Cornell Cooperative Extension. There are courses covering commercial production topics like raising veggies, berries, and poultry, and many more covering management of a successful farm, including business planning, holistic financial planning, marketing, and getting started in farming. (View all 12 courses at http://nebeginningfarmers.org/online-courses.) 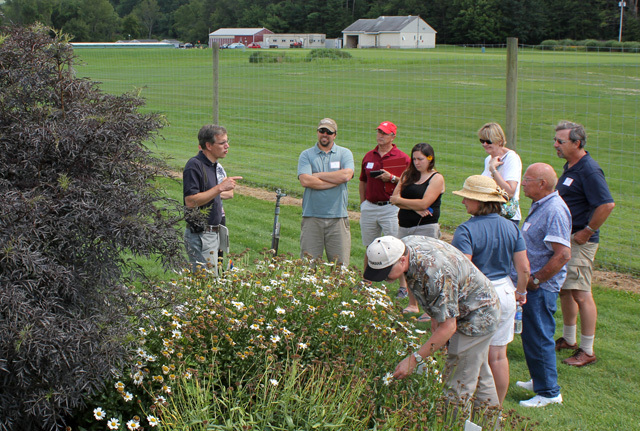 They are taught by experienced Cooperative Extension educators, farmers, and other specialists. Courses are 6 weeks long, cost $200, and include both real-time meetings (online webinars) and on-your-own time reading and activities. There’s no academic credit, but those who successfully complete a course receive a certificate and are also eligible for Farm Service Agency (FSA) borrower training credit, which can improve your eligibility to receive a low-interest FSA loan. Whether you are a backyard gardener or farm a few acres, join us Sunday, Sept. 8, at Cornell’s Thompson Research Farm for an Organic Farm and Garden Open House. This event is hosted by Cornell University and Northeast Organic Farming Association of N.Y.
For more than a decade, the Thompson Research Farm has been a testing ground for research in organic crop production, from cover crops to breeding hardy new vegetable varieties. We’re celebrating with an afternoon of fun for the whole family where you can also learn how to improve your growing practices. The event is free and will run from 1:00 to 4:00 p.m. Light refreshments will be served. The Thompson Research Farm, part of the Cornell University Agricultural Experiment Station and the College of Agriculture and Life Sciences, is located at 133 Fall Creek Rd., Freeville, NY. 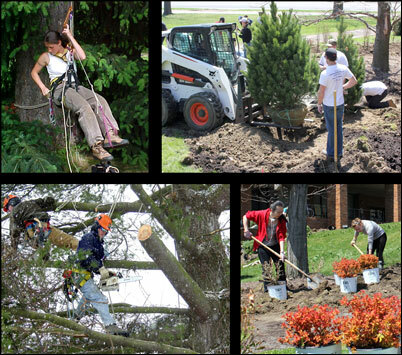 This course (new for Fall 2013) will prepare you to take International Society of Arboriculture’s (ISA) certification exam. 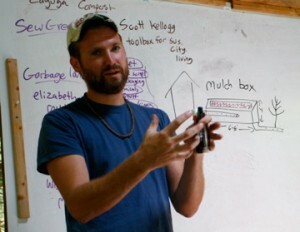 CALS online permaculture course returns [CALS Notes 2013-08-05] – Registration is again open for the online course Permaculture Design: Fundamentals of Ecological Design, offered September 9 to October 24, 2013 through the Department of Horticulture’s distance learning program. Great Lakes grapes [CALS Notes 2013-08-04] On July 25, the Lake Erie Regional Grape Program hosted a summer conference at the Cornell Lake Erie Research and Extension Laboratory to highlight new technology and new grape production and pest management practices developed at the lab. Attendees learned the latest information on a range of topics related to vineyard-based integrated pest management (IPM), and the implementation and economics of precision viticulture. Gardeners’ delight? Or fright? [CALS Notes 2013-08-02] – Bernd Blossey, an associate professor in the Department of Natural Resources, was studying the effects of three types of non-native plants believed to be disrupting ecosystems in 15 Northeastern forests when he stumbled upon the real culprit: Non-native earthworms. 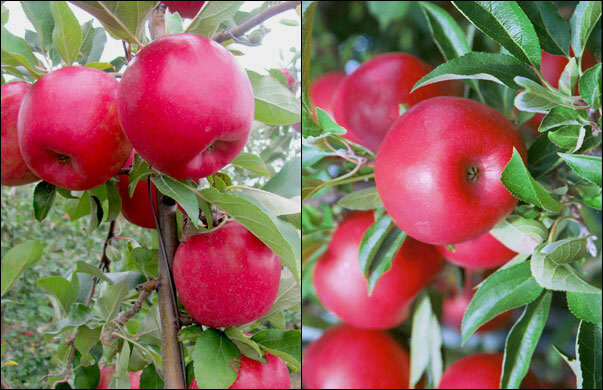 GENEVA, N.Y. — Cornell has announced two new apple varieties developed in partnership with the New York Apple Growers (NYAG). They are SnapDragon and RubyFrost, and they have undergone a year of rigorous consumer testing as NY1 and NY2. 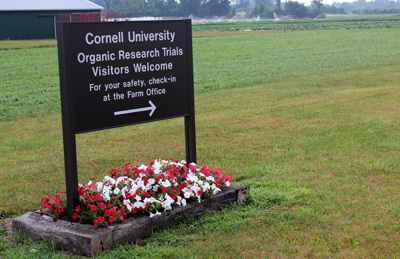 The new names were revealed Aug. 1 by Jeff Crist, vice chairman of the NYAG board of directors, at a field day at the New York State Agricultural Experiment Station, where Cornell breeder Susan Brown developed the varieties. “SnapDragon is a great name for this apple because consumers found its crispy texture and sweet flavor so appealing,” said Mark Russell, an apple grower and NYAG member. He anticipates it will be a popular apple for snacking, especially for children. Monday August 12, 2013 – 4:00 to 7:00 p.m. Turf specialists Frank Rossi, Department of Horticulture, and Jennifer Grant, NYS IPM Program, along with Golf Course Superintendents Andy Wilson, Eric Newell and Kathie Wegman, will lead a tour and discuss their thirteen years of applied research on reduced pesticide and fertilizer use. Tour the Green Course at Bethpage State Park where conventional, IPM, and reduced-risk tactics for putting greens management are subject to an average 50,000 rounds of play per year. 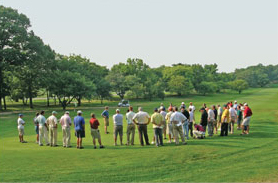 Also discuss and see reduced-chemical tee, fairway and rough management; what happens when pre-emergent crabgrass applications or broadleaf herbicides are skipped; how zoysiagrass tees fair on Long Island; and the use of reduced risk and alternative pest management practices and products.